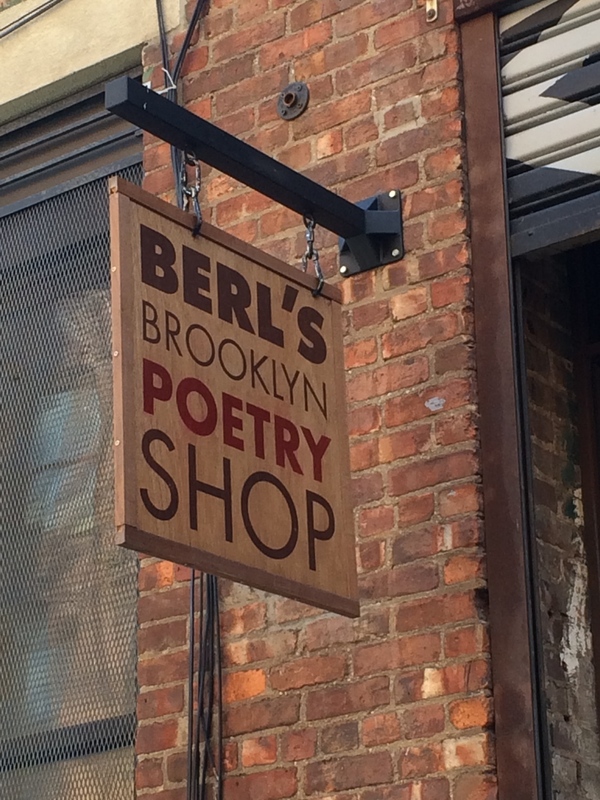 Berl’s Brooklyn Poetry Shop is New York's only all poetry bookstore. • A place to read, to hear poets read, to meet poets and readers, and to join a community. With the Manhattan Bridge rumbling overhead, we make our home amid a vibrant Brooklyn literary culture in DUMBO, near the former stomping grounds of Walt Whitman. Our shop is named after co-founder Jared White's late grandfather, Harmon "Berl" White, an inspiring entrepreneur and book lover. We envision Berl's as a new kind of bookstore, not a dense hive of shelves but a friendly, curated selection of small press books, a personal celebration of great writing with a special platform for handmade and limited edition works handmade by writers and publishers that often slip under the radar. We hope to be, in a sense, a museum for the poetry we love, human-scaled, offering visitors entry into a wonderful secret and a welcoming family. At Berl's, we strive to create a home for contemporary poetry that is ambitious, risky, passionate, open and fun. We carry a very wide range of books, from illustrated children’s poetry to conceptual projects, from micropress stapled pamphlets and chapbooks to thick small press anthologies, from high-art limited edition book arts and broadsides to traditional poetry collections. We joyfully follow our own muse in terms of carrying books we care about, hosting frequent events that represent a gathering of committed visions, personalities and voices, and making room for artistic experimentation that pushes the boundary of what poetry can mean. We stand for an open and welcoming community of writers and readers that aspires to upend intimidating hierarchies of fame and chauvinism; our books are alphabetized (backwards!) by first names, putting writers and readers on a level, eye-to-eye. This is to say: poetry is alive; poetry is a conversation; poetry is people.